Looking for an East Point air conditioning contractor? When you're in the market for an air conditioner, East Point's air conditioning experts at R Fulton Improvements are ready to help you select the right system for your home or business. Whether you're looking to cool one room or a whole house, we've got a product to fit the bill. R Fulton Improvements has been installing and servicing air conditioning systems in East Point, Georgia for over 20 years. Call us today for a free estimate for your East Point air conditioning installation or repair: (678) 251-9181. R Fulton Improvements offers window air conditioners and portable units suited for East Point residents. All of our East Point window air conditioners are energy efficient and some offer remote control operation. Most come with timers and digital displays. Portable air conditioners are a great choice if you live in an East Point apartment, townhouse, or condominium that does not allow window unit installation. We've been keeping homeowners in East Point, Georgia cool for more than 8 years. Let one of our friendly East Point air conditioning experts help you choose an air conditioner by calling (678) 251-9181. Split ductless AC systems for East Point homeowners. Call (678) 251-9181 for a free estimate for your East Point split AC system installation. East Point central air conditioning. Central air conditioning offers maximum cooling for every room in your home. R Fulton Improvements offers East Point central AC systems designed to keep everyone in your family cool with the convenience of remote control operation and individual room temperature control. 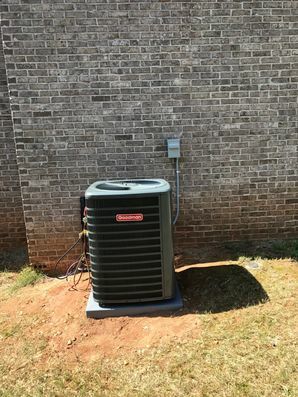 R Fulton Improvements has been installing central air conditioning systems in East Point, Georgia for more than 20 years. Our Georgia licensed HVAC technicians can perform a load calculation and recommend a system based on the square footage of your home. Call (678) 251-9181 today for a free East Point central air conditioning installation estimate.